Doesn’t this look wonderful. So you can brag about it you need to make this all organic ingredients recipe. It has a spice that is usually only found in German breads. Can you guess which one? If you guessed caraway seeds, then you were right. I have never seen the seed used in any North American dish, but it is used in traditional European cuisine, and is one of the dominant spices featured in several savory dishes. The seed or herb is very aromatic. The caraway is a member of the Umbelliferae family, which includes other herbs and spices like parsley, dill, anise, fennel, and cumin. An herbal tea prepared with caraway seeds is used as a remedy for digestive disorders, heartburn, loss of appetite, and to dispel intestinal worms. 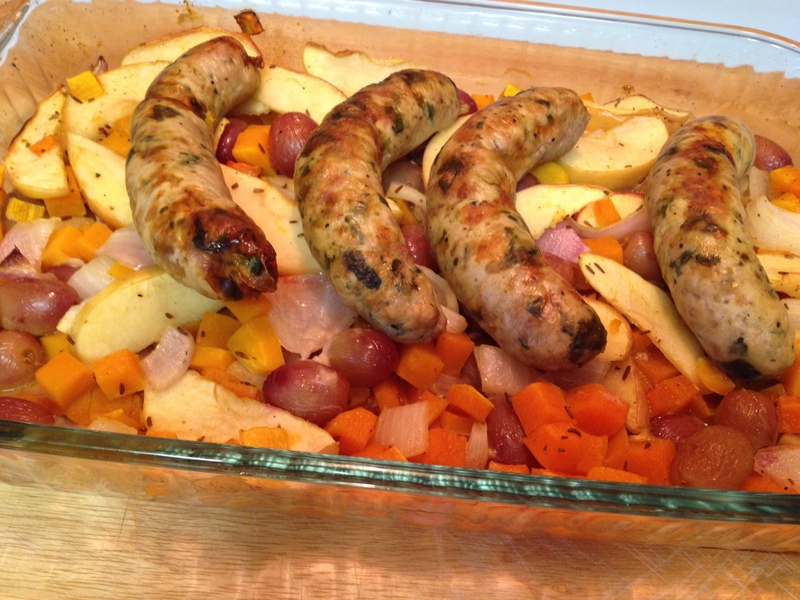 Now for our featured recipe: Roasted Turkey Sausage with Apples and Butternut Squash. 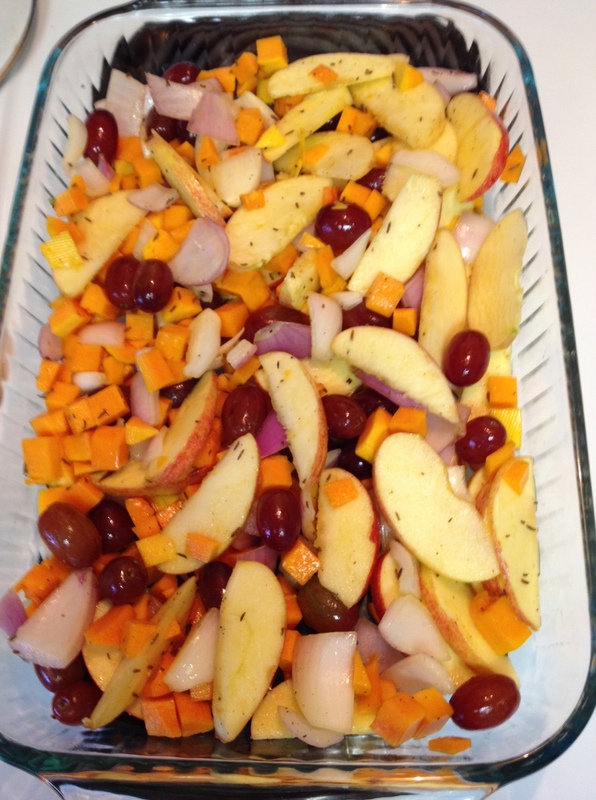 In a roasting or baking dish combine squash, apples, red grapes, and onion. Sprinkle with olive oil, crushed caraway seeds, sea salt, black pepper and toss to coat. Arrange sausages over the top. Roast until sausages are browned and hot all the way through (165 degrees), and squash is tender, about 25 to 35 minutes. Plate and serve. No side dish is really need, as this roasted dish provides vegetables and fruits. Enjoy!! 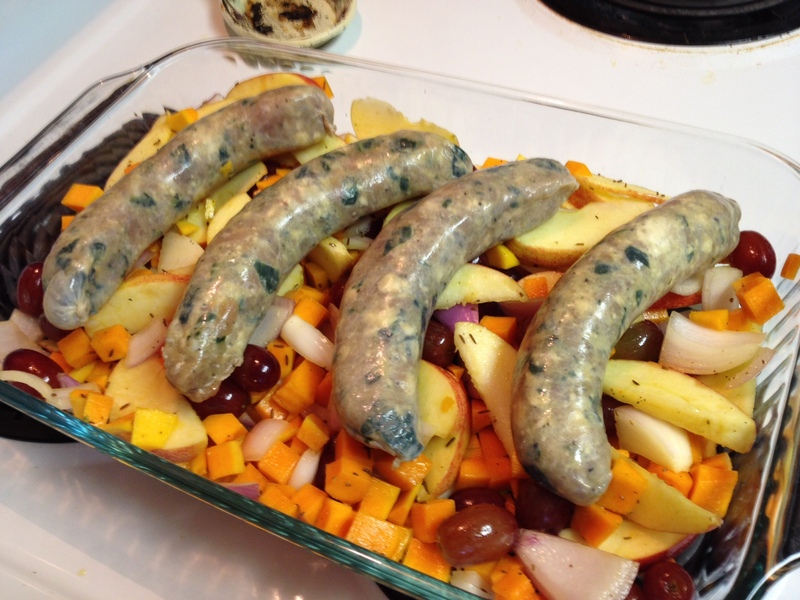 This entry was posted in Main Dish and tagged apples, Black pepper, Butternut squash, caraway seeds, Himalayan salt, Organic foods, roasted vegetables, Sausage, Turkey, turkey sausage. Bookmark the permalink. This fabulous one dish meal is great for busy fall evenings. Try this Roasted Turkey Sausage with Apples and Butternut Squash for a flavorful combination of butternut squash and apples. Thanks Jovina. Really easy to prepare in under 45 minutes from start to finish. The caraway gave the dish a unique flavor. Thanks for taking the time to stop by and leaving a comment. You read my mind Roger. I thought about saying that in the post could be part of the dinner. As it has turkey sausage. As always Roger, your comments are appreciated. It also makes me happy that you save the recipes for Aaron to prepare.